Holder Plate: 28.5 x 18.5cm (L x W). It can be easily adjusted to 7 angle settings and conveniently folds down flat when not in use. Adjusted to 7 angle settings. 1 x Reading Rest. Allow very thick book. 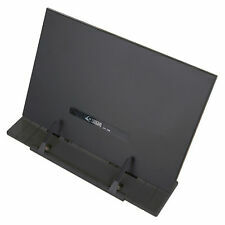 It can be easily adjusted to 7 angle settings and conveniently folds down flat when not in use. Holder Plate: 28.5 x 18.5cm (L x W). Adjusted to 7 angle settings. 1 x Reading Rest. Allow very thick book. 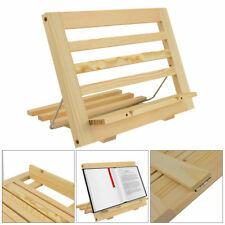 This traditional cookbook stand has a lip to hold your cookbook open at the correct page. Front flap to hold page open. Hinged to open and close easy. We aim to resolve any problem as quickly as possible. 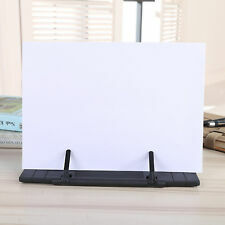 1 Book Holder. With thickened non-slip pads at the bottom, the bookstand can remain stable on the table. 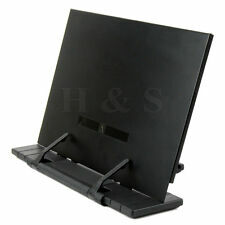 Made of stainless steel, the bookstand is sturdy and durable with stylish and simple design. Make travelling more comfortable with this inflatable tablet and book stand - ideal for watching your favourite show or reading whilst on the go! The lightweight inflatable wedge cushion keeps a tablet, e-reader or book at the perfect angle and leaves your hands free to turn the pages, browse online or help yourself to a drink. Deflates and folds up to fit in your bag, making it a perfect travel accessory for anyone who loves to read. You can use it on the floor, on your lap, lying in bed, sitting in the car or on a table. Made of PVC with polyester velour cover. Hand wash only. Stainless Steel Cook Book Stand. Simply let us know and we will resolve the issue as soon as possible. Aesthetically Designed & Neat Shape. 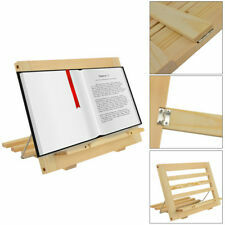 This traditional cookbook stand has a lip to hold your cookbook open at the correct page. Front flap to hold page open. Hinged to open and close easy. Functional and light, this Woodluv Bamboo Reading Rest Cook Book Holder Rack Stand, adds charm to every kitchen, office or music lesson. Use this for your kids Piano lessons, on the side when you are baking or cooking to rest your recipe book. May be helpful in the kitchen when preparing your difficult recipes or when watching a video on your tablet. Adjustable to fit most books and tablets.